I have a feeling I’m not alone in saying I am SO ready for Fall to finally be here! It’s not just the endless baking that’s got me excited, but it’s the actual ingredients I get to bake with. Yes there’s pumpkins, cranberries, and squash, but most importantly there are sweet delicious apples! The only thing more fun to bake with than apples themselves? Well, that would be apple cider! If you’ve never had the pleasure of eating apple cider doughnuts at the fair or any “you-can-pick” farm, now is your chance to make and devour them at home. I can’t wait for you to try these fluffy Vegan Apple Cider Doughnuts! Growing up, I always looked forward to Apple Picking at Beak & Skiff Farms in Upstate NY. It wasn’t just the fact that I would eat handfuls of apples right off the trees, but it was the bags of apples my family brought home for baking that was the real treat. While I was at Beak & Skiff, I would always grab a fresh baked good and come home with a few cartons of fresh cider as well. I’m not going to lie, back then my baking skills weren’t quite as adventurous, so apple season pretty much meant endless apple crisps. However, getting an apple cider doughnut out at the store or a “you-pick” farm was always a favorite treat of mine. When I thought about what the first Fall recipe should be on the blog, my mind immediately drifted to creating a vegan version of these fluffy cider doughnuts! What really made these doughnuts go from good to great was the first step in the recipe; reducing the apple cider. This was a trick I actually first stumbled across reading taste of home’s apple cider doughnut recipe, so I knew I had to try it when making my vegan version. To test them out, I tested these doughnuts with and without reducing the cider. While this recipe still works without reducing the apple cider, the flavor is SO MUCH better when you do! I also decided that I’d go ahead and add some applesauce to the recipe as well because… the more apple, the better! To finish off the doughnuts, you’ll want to roll these doughnuts in a mixture of cinnamon and sugar TWICE for perfectly coated doughnuts. These doughnuts are another baked doughnut recipe so you will need to use a doughnut pan to make them. My favorite brand is the Wilton Donut Pan as it’s non-stick and so easy to clean. Honestly, I’m not to keen on fried food, so this pan is worth it if you’re ever going to bake doughnuts! If you go out and buy this pan you may want to follow up this recipe by making my Vegan Lemon Lavender Doughnuts or Vegan Champagne Doughnuts too! I can’t wait for you all to make and devour this perfect Fall treat! If you follow me on social media @ShotGirlTallOrder, you know there’s a bunch of fall cakes, buns, and savory dishes coming your way in the next few weeks. Don’t forget to tag me in any of your creations so I can share them as well. I’ll see you back here next Wednesday for something a bit more savory! Begin by adding your apple cider to a small pot and bringing to a boil. Reduce heat to medium and reduce until you have 1/2 cup of apple cider left. Once the apple cider is reduced, let sit for 10-15 minutes to cool before using in your recipe. Once cooled, preheat your oven to 350F. In a large mixing bowl, add your apple cider, apple sauce, melted coconut oil, vanilla bean paste/extract, and 1/2 cup sugar. Whisk to combine. In a separate bowl mix together your pastry flour(white and whole wheat), salt, cinnamon, baking powder, and baking soda. Once mixed, slowly add this dry mixture to the large mixing bowl containing the wet ingredients. Stir until a thick batter is formed. Spray your doughnut pan with a cooking spray. Next, add your batter to the pan making sure not to cover the holes in the center. The batter should make 6-8 doughnuts. Bake the doughnuts for 15-18 minutes until they begin to brown. Remove the pan from the oven and carefully invert onto a drying rack (I like to bring the drying rack up to the pan and then flip it there to make sure the doughnuts don't fall apart). Let cool for 5 minutes. 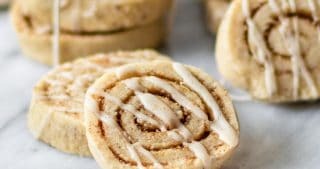 While the doughnuts are cooling, prepare your cinnamon sugar topping by adding your melted coconut oil to one small bowl and your cinnamon sugar mixture to another small bowl/plate. Take each doughnut and VERY lightly dip it into the coconut oil on both sides and then dip into the cinnamon sugar mixture. Let the doughnuts sit for about 10 more minutes and then dunk into the cinnamon sugar mixture one more time to evenly coat. Enjoy!